William Young, my 2nd great grandfather, was born in 1815 in Radnor, Wales. His father was William, occupation carpenter, mother's name not known. On the maternal side Elizabeth (Betsey) Williams was born in Hay-on-Wye, Brecon, Wales and christened on 26 December 1819. Her father was Mansell Williams, a Hatter, her mother was Mary nee Price. The Brecon area of Wales is craggy and wild with moors, cliffs and deadly mists that appear from nowhere. There are haunting castle ruins, woolly sheep with black faces and feet, biting, kicking horses and villages with non pronounceable names. There were two other known children in the Williams family, William born in 1822 and Sylvia in 1826. On William and Elizabeth's marriage certificate he is shown to be a stone mason, Elizabeth a servant. They were married, by banns, in the Parish of Hay, Brecon on 7 June 1841. At this time William's father was shown to be a carpenter and Mansell Williams was a labourer. William and Elizabeth had at least four children, William, Henry, George and James. As they were married in 1841 and William was not born until 1845, it is possible that there were children born prior to him. As at the 1851 Census for Wales, William (age 36, b. 1815) and Elizabeth (age 30, b. 1821) were living at West Wall, Presteigne, and present at that time were William age 5, Henry age 2 and George only 2 months. An Elizabeth (nee ?) Young, widow, aunt, aged 45, was also present. The Census showed that William (father), William (son) and George were all born in Radnor. Elizabeth was born in Brecon, and Henry was born in Pontypool, Monmouthshire. According to the census for 1861 William is now a widower and (aged 47), still living at West Wall, Presteigne. Also in the household was Henry (aged 12), George (aged 10), James (7) and Elizabeth, aunt, unmarried, aged 60 - housekeeper. The above suggests that William's wife Elizabeth died sometime between the census' of 1851 and 1861. By 1871 William (snr.) had moved to Knighton - so far his death date is not known. There were many very old graves and raised vaults in the churchyard, hardly any inscriptions were decipherable. It's not that they're 'all' that old - it's the weather! Nothing else is known about William and Elizabeth (Betsey). My great grandfather William Young was the first child born to William and Elizabeth (Betsey) nee Williams. He arrived in the world 4 April 1845 at West Wall, Presteigne, Wales. and assize town in Wales and England. 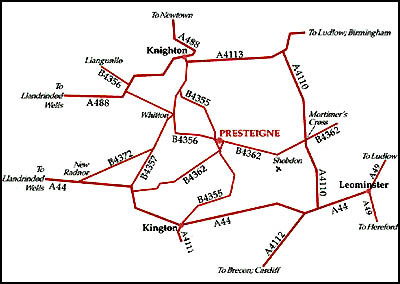 Presteigne is situated on the South bank of the River Lugg, which here divides England from Wales. 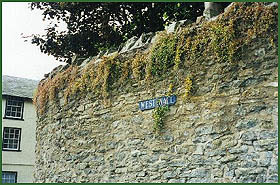 The West Wall is still standing, as is the group of cottages where his birth possibly took place. According to the local Vicar there never was a North, South or East Wall - however the West Wall - a high, dry stone wall - remains today. 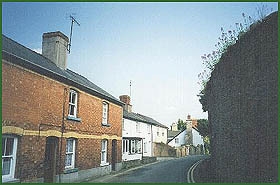 The village of Presteigne still has several Black and White timbered cottages and Georgian houses, and no fewer than 30 of its present buildings were once inns! 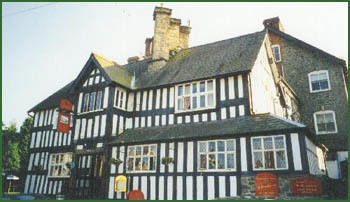 The partly timbered Radnorshire Arms has a priest's chamber, or hiding place, dating from Tudor times, and secret passages. 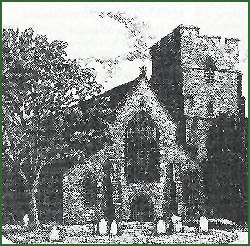 On 27 May 1873 William Young, grocer married Anne Taylor in St George's Church, Parish of Claines, St Georges, Worcester. 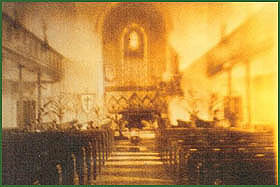 (This church is very near where Anne was living and working as a housekeeper in 1871). There is a church on the same site today, but it's not the original building. 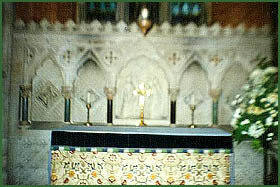 It was a Chapel of Ease and according to the Dean of Worcester had been outgrown and a new church erected. 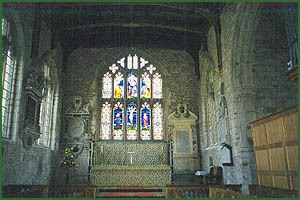 The frieze from the old church and some of the original family pews are in the Lady Chapel of the new church. 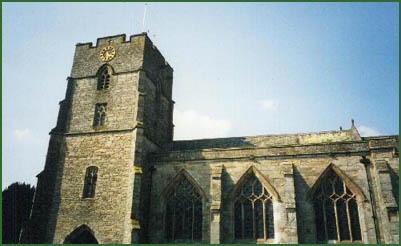 The imposing red brick building with two spires is in a lovely position at the end of a square facing on to a velvety green lawn planted with shrubs and trees. There are a number of ancient headstones scattered around the church grounds. On their marriage certificate Anne's father is said to be a farmer, while William's father was a stonemason. Click here for details on the lives of William and Anne following their marriage.